And last, but not least, we have the final track of the Big West Conference – The Clarence T.C. Ching Athletics Complex. And unlike the Mountain West Conference series where I saved the worst for last, I saved what may be the best for last in this series. 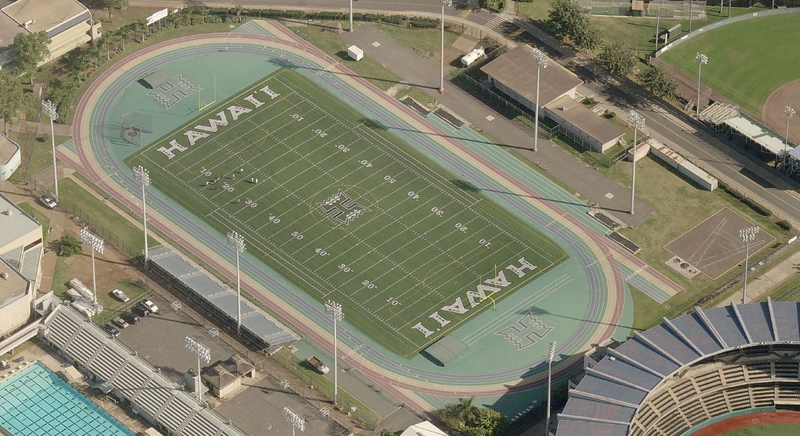 This is a newly renovated facility found on the University of Hawaii-Manoa campus. You’ll notice the rainbow-theme track, which is definitely a one a kind track. While this may seem a little crazy and over the top, when your team is the Rainbow Warriors, this is about as perfect as you can get, in my opinion. I think it looks awesome! *Note – The satellite photo is old and does not show the construction or upgrades that were completed this fall. *Update – There is a Google Streetview version for an up-close look at the track!